The Sea Eagle 370 is fast catching up to its little sister, the SE-330, as America’s most popular inflatable kayak. It is a little longer, offers more space for an extra person or extra gear, yet is still light, portable and can be assembled and inflated in only eight minutes. The SE-370 is 12’ 6” long, 2’ 10” wide and weighs only 32 lbs. easily able carry 3 persons or 650 lbs. It is made from tough, durable, extra thick K-80 Ploykrylar with high frequency welded seams and has 3 air chambers, port, starboard and floor. The floor is inflatable I-beam construction for extra rigidity. The K-80 is formulated with special additives to guarantee long term resistance to saltwater, ultraviolet rays, gasoline, oil and other chemicals. Unlike some competitive inflatable kayaks, the SE-370 has two molded skegs – just like a surfboard – so you go faster and further with less paddling effort. 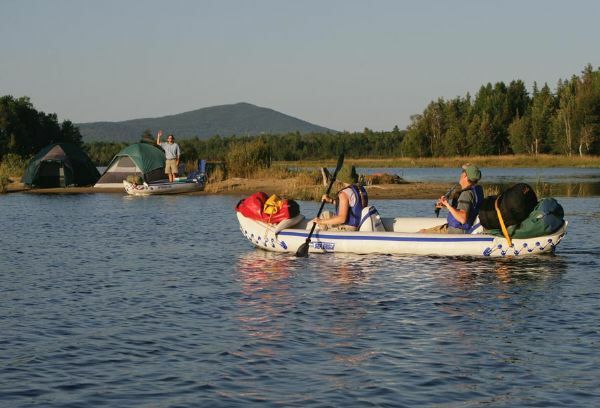 Inflatable kayaks without rear skegs just weave and wander across the water, wasting your paddling effort. Pressure gauge, repair kit and printed instructions. You can enjoy big savings by taking advantage of Sea Eagle’s Package Deals which include the SE-12.6srrik plus selected accessories at one low price.